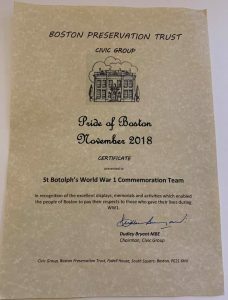 St Botolph’s is delighted to have been presented with the Boston Preservation Trust, Civic Group, Pride of Boston award for the Festival of Remembrance. The Festival of Remembrance, held from 29th October 2018 for 2 weeks, saw an array of exhibitions relating to WW1 and Boston. Working with partner organisations there were a host of different events and activities which people could be involved with. The Festival saw over 20,000 visitors with everybody giving positive feedback. We are grateful to the organisations who helped ensure the success of the festival, whether that be through grants, volunteering or any other support given. Do you have any highlights from the festival, perhaps you have some photographs you wish to share, please email festival@parishofboston.co.uk and we could use your images in future publications.